Are you interested in protective family dogs? Learn which breeds make the best family guard dog companions. Although most people consider the family dog a pet, canines often play more than one role in the family dynamics. Yes, they bring us comfort and affection, but in many cases they afford us a measure of protection as well. Any type of dog can display protective tendencies over its human companions, regardless of its breed or size. However, the ferocious growling and ankle biting of a Chihuahua is far less of a crime deterrent than the deep base bark and flashing teeth of a German Shepherd. 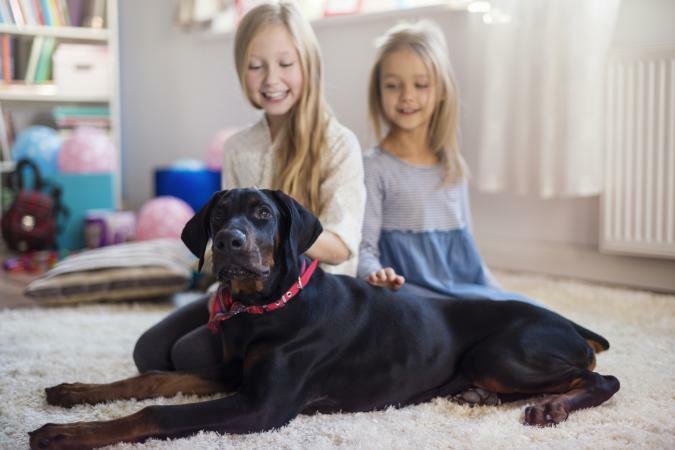 For this reason, when families are particularly looking for canine companions that will also protect the family, they usually look to larger dog breeds. Let's look at a few of the breeds associated most closely with family protection. The German Shepherd has long been regarded as the premier protection breed. The large size, deep menacing bark and piercing stare of a Shepherd is extremely intimidating when it's focused on you. These qualities, combined with the Shepherd's keen intelligence and loyalty to its people have made these dogs the number one choice for training as police dogs, and indeed, the breed is often simply called "police dogs" in some circles. In the home, the German Shepherd is a kind and loving companion to the people it knows well, and is guarded but respectful toward newcomers after a proper introduction has been made. To unknown intruders, the dog is a fierce defender of its territory, and woe to anyone who believes they can make it past this gatekeeper. Another fine German breed, the Rottweiler is famous for its massive build, with some specimens pushing the 180 pound mark. To look at one of these dogs is to experience a healthy concern for your self-preservation. Burglars and other criminals tend to feel the same way. Although these dogs appear very intimidating, you might be surprised to know that they are considered very good with children and display something of a herding instinct with their young charges. Of course, any dogs as powerful as this breed needs to be well socialized and trained from puppyhood for optimum handling. Respect the Rottweiler, and it will respect you. Anyone remember the film The Doberman Gang? This movie did more to scare the begeezuz out of anyone approached by a Dobe than the breed could ever have done for itself. The Doberman appears to be a streamlined version of the Rottweiler, but don't let its looks fool you into thinking this breed is any less useful as a family protection companion. The Dobe is still very well muscled, and its trim shape gives it even greater agility. While a Rotty can aim its bulk directly at an intruder and take him down, the Dobe can chase a criminal anywhere he thinks he can hide. This is one game of hide-and-seek where you never want to be tagged "it." Set the scary reputation aside, and the Doberman is actually a warm and loving family companion, and loyal to a fault. The breed is smart enough to train for just about anything you want them to do. The Germans certainly know how to develop powerful, protective breeds, don't they? The Boxer is yet another fine example of a protective canine companion. Square-built and sturdy, the Boxer has a decidedly stand-offish air around strangers, and a look that seems to ask ne'er-do-wells, "Do you feel lucky?" To its family members, a Boxer is the picture of domesticity. Of course, these dogs do need obedience training in order to become the best companions they can be. Boxers operate on a high energy level, so it's important to establish yourself at the top of the pack to maintain proper control over their rambunctious personalities. Now we come to a much maligned breed that is far more famous for the abuse it has received than for its true nature when not spoiled by people with bad intentions. The Pitbull is unfortunately the poster pup for so-called "dangerous" breeds. These dogs are generally medium-sized, but they are virtual powerhouses. They have been breed to fight other dogs for hundreds of years, so they naturally have incredibly strong jaws and large teeth. When a Pitbull sinks its canines into something, it's in no hurry to let go, and will shake its head vigorously to tear flesh from bone. A well-bred Pitbull is bred for a sound temperament, and is trustworthy around its human family. These dogs are even known for loving to clown around. This picture is a far cry from the dogs bred by shady characters involved in Pitbull fighting. Needless to say, Pitbulls require extensive socialization and training to fulfill a role as reliable family companions. Schutzhund training encompasses a number of activities, protection training being most important to our discussion. A properly trained Schutzhund dog will not attack automatically, but rather respond to direct threats, and commands. As such, protection dogs should never present a danger to their own family members. Many dog training schools offer courses in canine protection; however, there is one thing you should keep in mind about protective family dogs. A dog should be a pet first, and treated with the same care and love you would lavish on a Toy Poodle. Put your pet's mental and physical well-being first and he'll reward you with his love and loyalty.